Melanie Charles is a première artist that has taken on the world. She does not know bounds or limitations. Charles is well traveled, bringing her talent to various countries and musical scenes. She is a proud Haitian-American and embodies the traits of the culture. A sweet, polite, and giving person; her personality wins you over more than her musical performances, which are phenomenal in their own right. 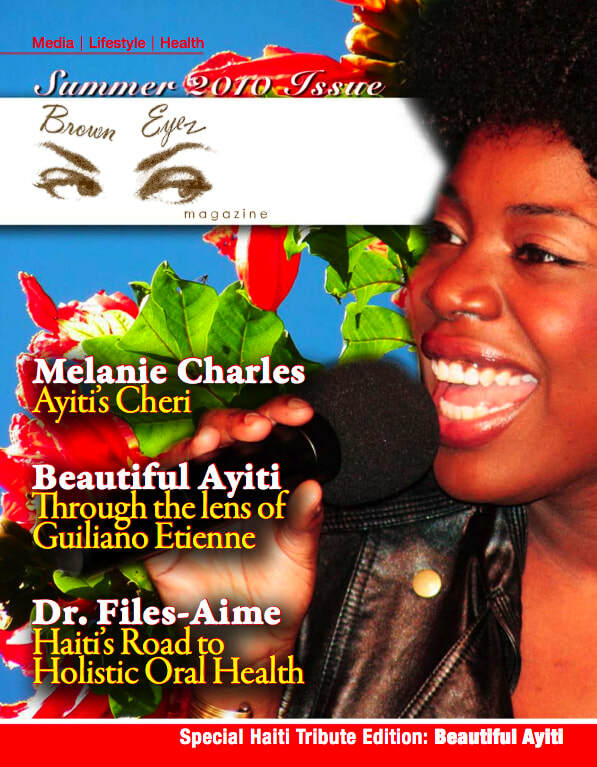 In this issue to honor Haiti, it was only fitting that we interviewed Haïti’s Cherie. B-E-M: Did you always know you wanted to be a singer? MC: YES! Actually, NO but YES! Let me explain, I was always musically inclined. I played the piano and I was a very advanced flutist and piccolo player. I played in orchestras and I was usually first chair or section leader. I also was a flute Major at LaGuardia High School. In the meantime, I was singing at the Brooklyn Youth Chorus, under the direction of Dianne Burken. With her I sang in Russia, Germany, everywhere! At the same time, I was studying Opera and winning Opera competitions. When I graduated LaGuardia in 06, I had to choose. To make a long story short, I went to the New School For Jazz and Contemporary Music, studied vocal jazz performance and here I am!! B-E-M: How did your music career start? MC: I always had a music career. I know it sounds funny. But my mother would manage my brother and I when we were young. We would sing at weddings and assemblies, talent shows, and compete. I would play the piano and sing and my brother would play his saxophone. We were some act! B-E-M: What does being of Haitian descent mean to you? How has it influenced your music? MC: Well I am connected with Haiti in a very interesting way. A lot of young Haitian people I know don’t speak Creole but know every single Kompas band. I speak Creole with my family, although I was born here, but I don’t listen to much Kompas! I’ve actually been influenced by old classic Haitian Folk Songs; songs like YoYo and Fey Yo. I take those songs and put a jazz and soul spin on them! B-E-M: You are accomplished off stage as well, how have things like your educational accomplishments contributed to your artistry? MC: Well, of course being Haitian-American means that I come from a place that expects greatness in whatever I do. And so my family has always been all about education, no matter what. So my mom supported me while I was at the new School I graduated with a 3.6 GPA. I am not a school lover! But I just like to do well at all I do. I believe finishing school equipped me with determination, the skill to articulate and problem solving; all of which are needed to be a successful musician and artist. B-E-M: Family, loved ones, and a strong spiritual foundation. These are all important fundamentals to life. How do these aspects influence you as a person and as an artist? MC: I know for sure that I would not be where I am today without my amazing family. My mom is such a soldier for me. Whenever I needed ANYTHING, for my music, I never had to ask. She already knew. And my aunt is my number one fan. Whenever I’m feeling down, she will just call me and let me know that she is listening to my album for the fourth time in that day! And my grandma who passed away, may she rest in peace was old school yet was always proud of my singing and would always brag to her friends in church! Those things really matter to a young artist and I am so grateful for such an amazing support system. B-E-M: Are there elements in the community you would like to see improved or introduced – either here or Haiti? Any initiatives you bring to the community? MC: Well since I am an artist, I would have to say there needs to be an improvement in the arts both here and in Haiti. When young people can play an instrument or paint a picture that strengthens their minds and helps them improve in many areas, even out side of the arts. Especially in this time of financial crisis, the young people need something more! And in Haiti, there are so many amazing young artists. Haiti has given birth to amazing visual artists and musicians. These people need to be nurtured and encouraged. Here in NY, I teach a number of music classes at the Excellence Charter School, all with the purpose of exposing young people to music and hopefully creating the next world famous musician! B-E-M: What projects are available to community now? MC: Well now I’m promoting the album! I’m booking some shows around New York and LA so please stay tuned! B-E-M: What are some future projects we can look forward to? MC: I’m releasing another Journey album in August or September. I am also working on a Jazz album and sometime in the fall, I will release my first Haitian Jazz Album! So there’s a lot going on. B-E-M: Where can we find out more about Melanie Charles? MC: I’m online, check me out anytime and often!